I have to wonderful opportunity to officiate a wedding this weekend. It’s one of those weddings where family and friends are intimately involved in every aspect. The venue is an old dance hall from 1887! The couple is putting their own twist on the reception dinner and having a fish fry! A nice alternative to the usual Texas barbecue. For all of you wondering, fish fries are BIG in Texas. It’s going to be dark when I drive out there for the rehearsal Friday evening, so I decided to take a little drive to find where I’ll be going. It’s rural out here. Two lane, sometimes one lane roads and maybe a sign. And, of course, the directions I was given were for someone who’s lived here their whole life … directions by landmarks and how it is known by the locals. It’s a beautiful autumn day. The trees are in full golden red splendor. A terrific thunderstorm swept through the county that morning, giving our very dry land some moisture and sparkles for the sky. The cows, sheep, and goats augment the pastoral scenery. The agricultural tax exemption might have been the real reason these acres had livestock. The animals could be considered installation art, but I don’t think there’s a tax exemption for any kind of art. So I’m enjoying this beautiful drive when I notice some things on a fence coming up around the corner. I don’t know about where you live, but right after Halloween, people in town started decorating their yards for Christmas! Christmas wreaths and over-street garland already adorn Main Street. The Christmas tree and giant German Christmas pyramid (Weihnachtspyramide) have been erected at the Marketplatz (aka town square) in anticipation of the lighting ceremony November 25. These, as you can see by the picture, are not Christmas or holiday decorations. 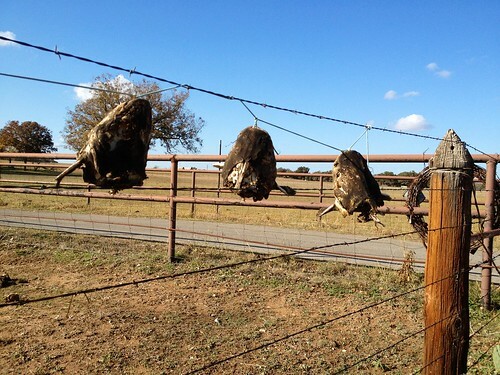 They are, however, typical Texan fence art! Can you guess what they are? Let’s have some fun. Put your guess in the comments and we’ll see who can figure it out this yard art … only in Texas! Hint: I wonder if noodling was involved. My guess is very large cat fish heads. Hmmm…on closer examination, I think Jacquie’s got it! Catfish heads.